Peshawar: Poliomyelitis (shortly known as polio) was one of the most feared diseases in industrialized countries in the early 20th century. It paralyzed hundreds of thousands of children every year. With 132 cases, the first outbreak of polio epidemic was from Vermont USA in 1894. Since then Polio is still a nightmare for many countries across the world, including Pakistan. Among neighboring countries, India and Iran are polio free while Pakistan and Afghanistan are not. Pakistan had twice no. of cases reported in contrast with Afghanistan in 2016 (08:04). The Expanded Programme on Immunization (EPI) was launched in 1978 in Pakistan with an aim of protecting children by immunizing them against Childhood Tuberculosis, Poliomyelitis, Diphtheria, Pertussis, Measles, and Tetanus. The Polio Eradication Initiative (PEI) was launched in Pakistan in 1994, 15 years after the launch of the EPI, with a mandate of performing routine immunization activities. The government has been spending worth billions of Rupees every year on health including non-communicable diseases. Polio has received a major share of this funding in last 5-10 years. Different projects and reforms including Supplementary Immunization Activities (SIAs), house-to-house campaigns to reach and vaccinate each and every child under five years of age with the Oral Polio Vaccine (OPV), community awareness, mobile team vaccination etc. were trial and tested. As a result of these, compared to 2010 benchmark (100%), polio cases have decreased to 6% in 7 years (from 144 to 08 cases) which is really appreciable. A total of 882 cases were reported from 2010-2017 (8 years) which truly marks the efforts and money utilized on the cause. Of all the cases, FATA has almost half the cases. AJK has no case since these years. 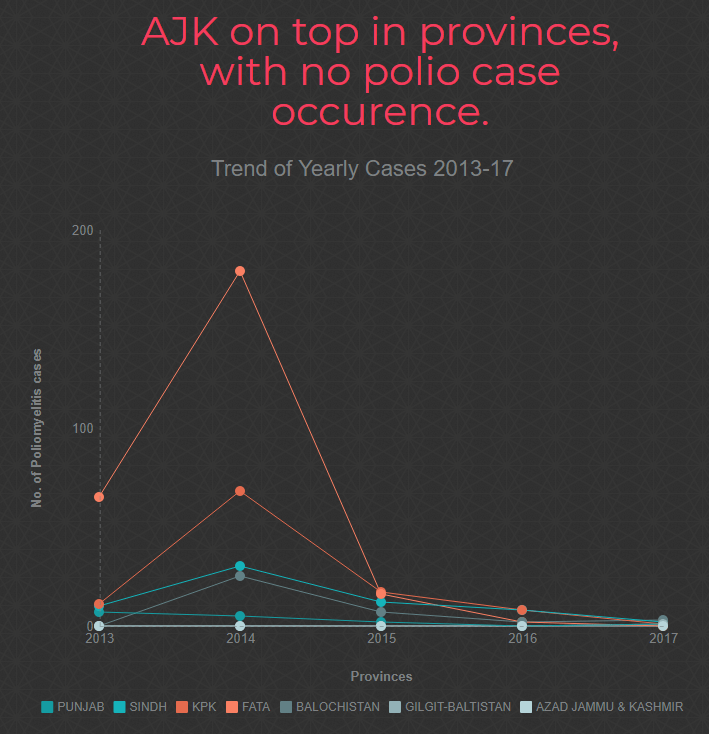 AJK on top in provinces, with no polio case occurrence. According to Dr. Sania Nishtar, a health professional and currently Co-Chair of the High-Level Commission on Non-communicable diseases, “Polio requires standalone high-level advocacy because total eradication requires a comprehensive approach and commitment from government. The failure of local governments to provide the basics—clean water and proper sanitation—is a problem for polio eradication and public health more broadly. The government needs to prioritize implementing these fundamentals. There is a need for better accountability across all levels of government to counter ‘ghost vaccinations’, immunizations that are reported but have not taken place. Routine immunization programs, coupled with initiatives such as support of clerics through the ministry of religious affairs for positive immunization, support from agencies on the ground in areas that are difficult to reach, is the need of the day. Polio, TB and Dengue remained one of the priority areas in heath for current government’s mandate in Punjab in last 5 years. Among the list of health care reforms implemented in Punjab by Chief Minister Punjab Mr. Mian Muhammad Shehbaz Sharif, polio campaigns were in high flung. The heavy investment was fruitful and the results are obvious. In 2016 Punjab’s extensive polio efforts were successful with no case reported. 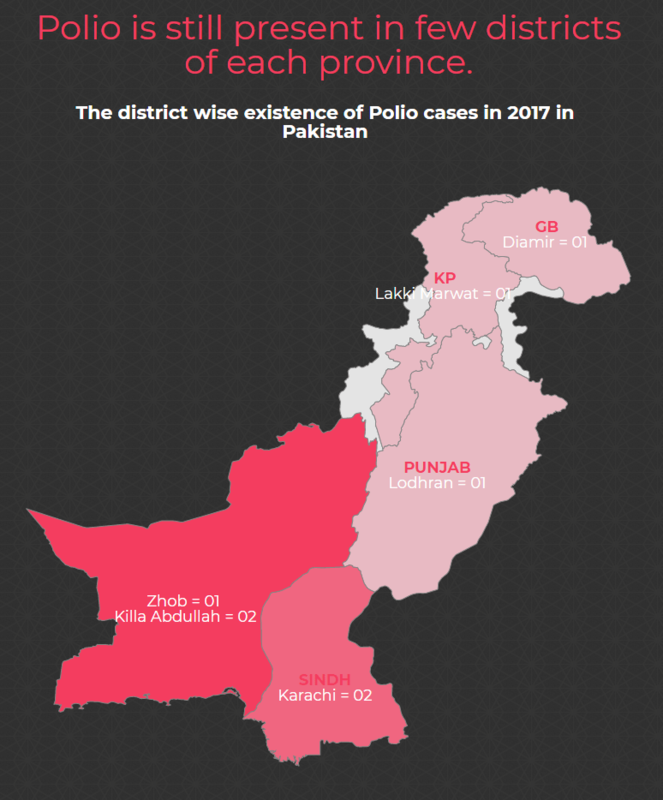 However in 2017, one case was reported in district Lodhran that took away polio free status from Punjab. The Health department of Punjab govt. is not hopeless, their campaigns are still on peak. If the priority and funding persists, Punjab will become polio free in coming year. Polio is still present in few districts of each province. In Pakistan, more than 14,000 full-time Community-Based Vaccinators work throughout the month to reach every child in their area with vaccine, and generate demand for routine immunization. Clearly as their name indicates ‘Sehat Muhafiz’, or ‘Protectors of Health, these are critical to the global eradication effort. Bibi Hoor, a 70-year old women of Pishin district is a Sehat Muhafiz in seasonal polio campaigns. Pishin is a high-risk area for polio since many years where she works as community based worker. In every campaign she vaccinates more than 200 children on the average. “Family size is above 10 in every home with around 7-8 children. I get assigned to vaccinate all these children. Often there is refusal from parents, I try my best to convince them. I am primary pass but I know my job — how to vaccinate children, the polio vaccine efficacy indicator and door marking technique. I count the vaccinated children on my prayer-counter (tasbeeh) and then write it down. I also counsel them on importance of regular immunization”, said Bibi Hoor. Since 2015 Pishin has no reported cases yet the environment samples gave positive results for the virus that stresses the need for continuation of campaigns. And so is the scenario for many other affected areas across the country. In May 2017, five country wide campaigns were run for vaccination against polio. Under this campaign 250,000 trained polio workers vaccinated 38 million children under the age of 5. This was one of five country-wide vaccination campaigns that took place during the 2016/2017 “low season” for poliovirus transmission. From October to May when temperatures are low in Pakistan, the virus remains less/in-active thereby giving polio eradication experts the opportunity to get ahead of the virus. “The superb efforts of FATA EPI teams succeeded FATA to be polio free in 2017. The recent focus of polio programmes has been on reaching and vaccinating persistently missed children and high-risk mobile population. It is important that we should continue to strive for keeping this status. A constant check on the mobile population is to be kept, as they could be a source of transmitting the virus from other regions to FATA”, says Emergency Operation Centre (EOC) Coordinator Dr. Fida Muhammad Wazir. Polio vaccines are vaccines used to prevent poliomyelitis (polio). There are two types: one that uses inactivated poliovirus and is given by injection (Inactivated Polio Vaccine: IPV), and one that uses weakened poliovirus and is given by mouth (Oral Polio Vaccine: OPV). EPI programme is using a combination of IPV and OPV. This helps to boost children’s immunity and provides a stronger protection against polio. IPV and OPV strengthen immunity in the blood and gut respectively. Polio campaigns are usually run during Apr-May in Pakistan. During the months of Oct-May, low temperature makes the virus less active. In line to this, the campaigns are run before the virus gets active providing an opportunity for “prevention is better than cure”. The terrorism layers in Pakistan also hit the Polio campaigns adversely. The incidents started back in 2012, around 90 polio workers were killed in last five years. Around 18 polio workers are killed on average every year in Pakistan. However this has not affected the commitments of the polio workers and the government. Pakistan will continue to abide by international commitments in this regard. While the world is on the brink to say Forever Goodbye to polio, only 3-4 countries including Pakistan, Afghanistan and Nigeria are left with the existence of this epidemic virus. In the past 30 years donors have put on trillions of dollars to eradicate the root cause. The great news is that there were only 37 reported cases in last year. Building on the lessons of China’s strategy in polio eradication, Pakistan should develop grand national immunization days, outreach drive beyond traditional vaccination in high risk areas, military support in terrorism hit areas and the creative use of quotes from Holy Quran to present this as a “Right to Life” issue. The final point is a full eradication and Getting To Zero. And to hit the zero mark, a consistency in campaigns, full commitment to the National Emergency Action Plan (NEAP) and funding for next few years is still required. 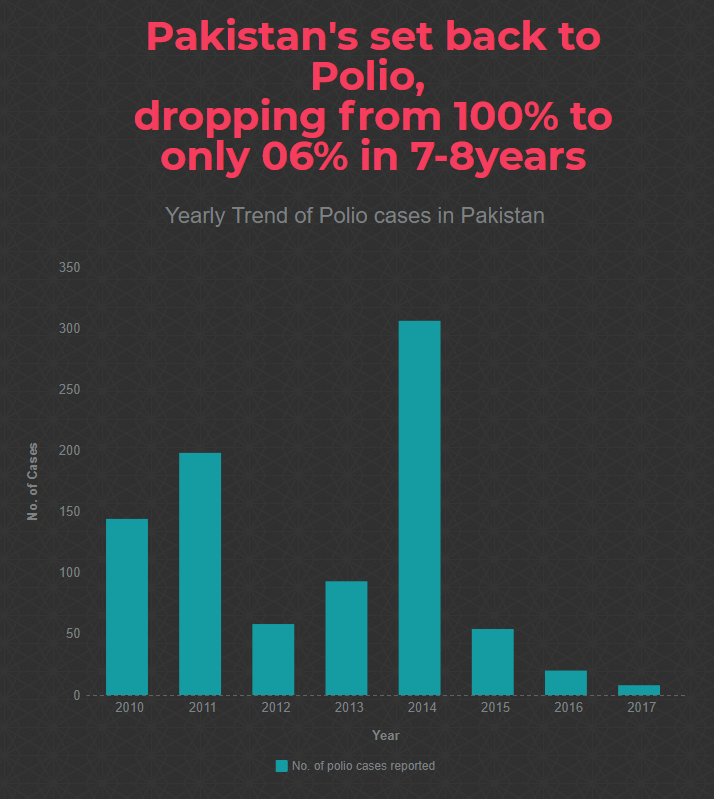 If current strategies continue, Pakistan can be polio free by 2020.